The McLaren 600LT Spider is one of the few drop-top sports cars with barely any compromises over the coupe. It’s just 110 pounds heavier than the fixed-head version but, besides that, it offers the same 592 horsepower and 457 pound-feet of torque from the 3.8-liter twin-turbocharged V-8 engine. The catch? 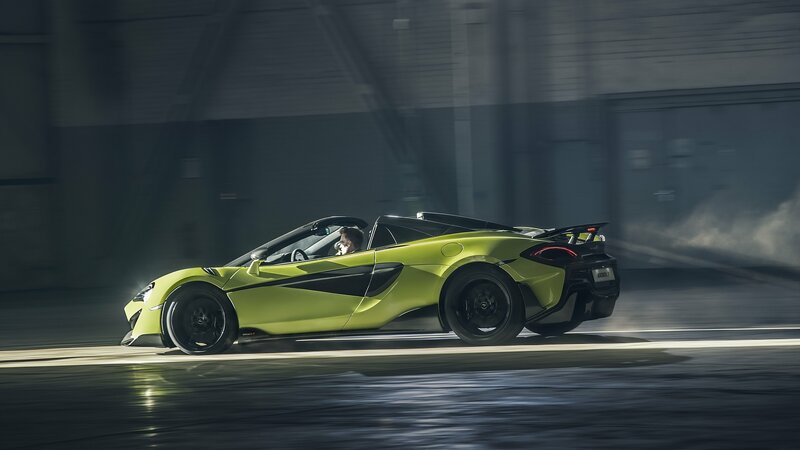 It costs almost $50,000 more than the 570S Spider that McLaren used as a starting point for the LT.
After teasing us with a video just a few days ago, McLaren finally released the official images of the mighty 600LT Spider. Again, LT stands for ’Long-Tail,’ but there is no long tail on this car to speak of, it’s merely as a pale homage to the Le Mans class-winning McLaren F1 GTR from 22 years ago. What you do get, though, is a highly competent track beast with the added benefit of being able to allow the elements to take their toll on you when the roof’s down. If you like what you’re hearing you should rush to pre-order one because McLaren said that the production would be limited with “build slots scheduled around other Sports and Super Series models.” Production is said to commence in March and will go on for a year. The only problem with the 600LT Spider is, frankly, the existence of the Ferrari 488 Pista Spider with its 710 horsepower, 568 pound-feet of torque that’s likely quicker although it also costs a lot more as well.